Although global death rate from the disease has dropped in between years 1991 and 2016 falling at a rate of about 3% per year to reach 1.3 million deaths at 2016 (2), the alarming spread and resurgence of resistance to treatment makes proper diagnostics, care and prevention of transmission options the main areas that need consideration and proper actions. TB is among the top ten causes of death in Zimbabwae killing 3900 people in 2012. (3)Together with HIV and malaria, TB is responsible for the great majority of deaths in the country in both male and female population. The sum of years of life lost due to premature mortality (YLL) In the Disability-adjusted life years (DALYs) estimate of disease burden in 2012 due to the three diseases (HIV-TB- Malaria) is about 2.5 K (4) which makes the country the 17th highest tuberculosis burden country in the world. It is proposed that the re-surgence and spread of TB is associated with the high prevalence of HIV in some African countries. Zimbabwae is one of the top 8 African countries with the highest burden of TB, TB\HIV and drug resistant TB and that makes TB problem in the country more complicated with multiple interacting dimensions. TB can affect people at any age group being caused by an infectious agent however, people who are immunocompromised are at greater risk. HIV patients are among the most common type of immunocompromised patients that are at 20- 30 times greater risk of developing active TB infection. (2) Children are also at greater risk of developing the disease and dying from it. Although the incidence of new TB cases in Zimbabwae is generally decreasing over time evident by the rate of (242 per 100000) in 2015 compared to (605 per 100000) in year 2000 (2), there may still be lack of complete accurate information about the actual rate of notification of new TB cases. Although smear microscopy is still considered the standard test used for case diagnosis, it is considered to be accurate only in half of cases. In addition to that, this method is difficult to use with children for technical reasons and cannot be used to diagnose extrapulmonary TB. Another important point is that it is less accurate in HIV patients who are considered a large population in the country with high HIV prevalence where TB is also considered a major cause of death in patients living with HIV in Africa. Xpert MTB/RIF® has been introduced since 2010 in many countries including Zimbabwae however, its use is not applicable to all settings, nor is effective for diagnosing children or patients with extrapulmonary TB. There are also some disadvantages related to cost of the test, technical requirements for stable electricity supply and instrument recalibration. Thirty four (34) million people worldwide live with HIV, the majority of them are in sub-saharan Africa. Affordable rapid diagnostics for HIV are available but majority of HIV patients are usually unaware of their disease status and do not seek medical advice. There are also some gaps in health care services available to HIV patients including routine viral load measurement and availability of second line antiretroviral treatment. The high percentage of HIV patients in Zimbabwae increases the risk of acquiring TB which further aggravate the problem. It is estimated that 80% of TB patients are co-infected with HIV (7). HIV is a powerful aggravating factor that increases the risk and susceptibility to acquire TB or to the progression of latent TB infection. It is considered the most significant contributing factor to the TB burden in the country where approximately 80 percent of TB patients are co-infected with HIV. This co-infection is considered a main cause for the high death rate among TB patients in Zimbabwe. HIV and TB are interlinked in a cross-interacting way; TB increase the morbidity and mortality in HIV patients and HIV is an aggravating factor for the TB epidemic. Lack of appropriate detection and notification of both diseases add a hidden element that can not be assessed and further complicate the problem. Some research reports showed that being HIV positive is associated with higher mortality rate among patients with TB in the country (8). Other research studies have also showed that the re-emerging TB epidemic reflects socioeconomic crisis and associated high HIV prevalence in the country (9). There is a need to organize for awareness campaigns to prevent new case incidence and to decrease the transmission of HIV among the population. Organizing campaigns for early intensive active new case finding to improve the TB notification rate and to have better and more comprehensive records for early better interventions. Increasing coverage rate of HIV screening to include all vulnerable population groups. Increasing fund allocation for developing new research programs and to include the area of developing appropriate diagnostic tools and platforms for TB to be applied in limited resource settings. Increasing laboratory capacity and availability of diagnostic services including staff, reagents and continuous material supply. Adherence to DOTS program to increase rate of TB treatment success. This is important to decrease disease transmission and cut the feedback loop. 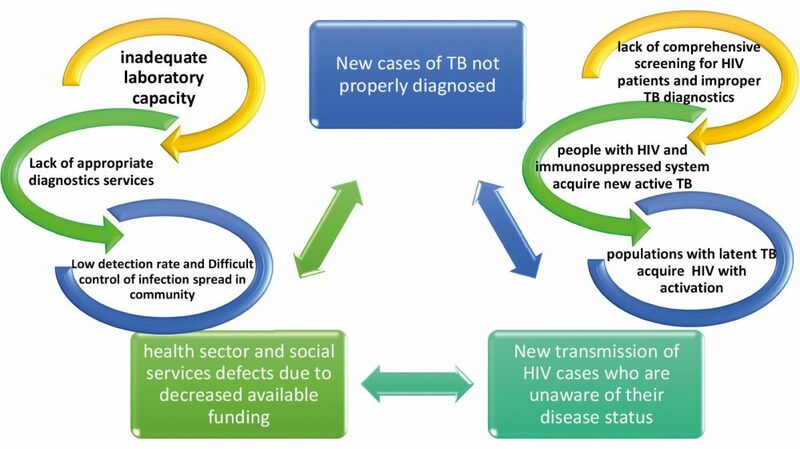 Interventions for Screening and treatment of latent TB cases living with HIV positive cases. Strict adherence and appropriate application of infection control measures in settings and communities where TB and HIV patients are crowded together (hospitals, prisons and military barracks and other congregate settings). This is extremely important to avoid positive feedback augmentation of the infectious transmission cycle in between Possible unknown HIV cases and TB cases which is difficult to control. World Health Organization (WHO), WHO Global Tuberculosis Report 2015, WHO, Geneva, Switzerland, 2015. 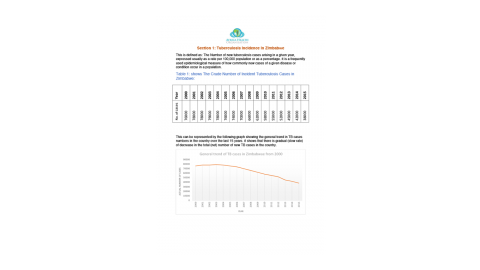 Global Health Observatory Data (GHO), WHO global Tuberculosis report 2017. 2015: Final Report. Rockville, Maryland, USA: Zimbabwe National Statistics Agency (ZIMSTAT) and ICF International. WHO, Global tuberculosis report 2014 (WHO/HTM/TB/2014.08), 2014. Zheng P, Fu H (2013) Prevalence of TB/HIV Co-Infection in Countries Except China: A Systematic Review and Meta-Analysis. MoHCC (Zimbabwe Ministry of Health and Child Care). (2014) The National Health profile 2014 Report. Harare, Government of Zimbabwe. Data are as reported to WHO. Estimates of TB and MDR-TB burden are produced by WHO in consultation with countries.